Starting today (Friday, 11/10), the Harvest without Violence Campaign hits New York City! Starting today, Friday, November 10, and continuing through Nov. 20th, the CIW’s new “Harvest without Violence” mobile exhibit is hitting the Big Apple! After weeks with no response to the CIW Women’s Group’s powerful letter to Wendy’s Board Chairman Nelson Peltz, farmworkers and their consumer allies are taking the fight to end sexual violence in the fields straight to Mr. Peltz’s doorstep in New York City. Over the next ten days, the CIW will display the Harvest without Violence exhibit in a number of high-profile locations throughout the city, including Columbia University’s Low Plaza, the Cathedral of St. John the Divine, and Washington Square Park (you can find a full schedule of exhibit locations and public events at the end of this post). 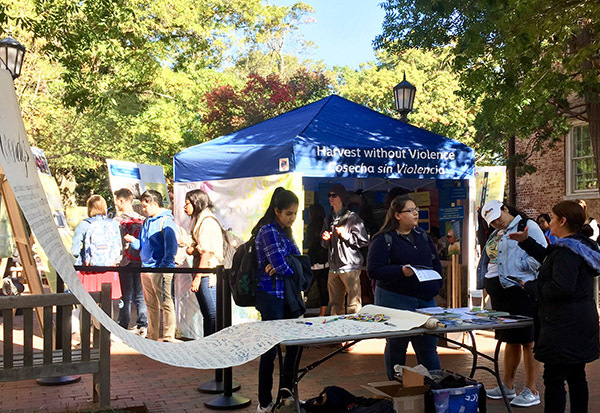 Students visit the Harvest without Violence mobile exhibit during a recent visit to the University of North Carolina. Then, on the CIW’s final day in New York City, November 20th, CIW members and allies will converge on Mr. Peltz’s offices in Manhattan to demand that Wendy’s do its part to end sexual harassment and assault in the fields by joining the Fair Food Program. If you live in the New York City area, make your voice heard in support of human rights and join us for this historic protest! How you can support the protest if you don’t live near New York: Take part in the National Call-In Day, Nov. 20th! Call Wendy’s Board Chair and urge him to join the Fair Food Program on Nov. 20! Wendy’s Board Chair and major shareholder, Nelson Peltz, has been called upon time and again to bring Wendy’s into the Fair Food Program. As Board Chair and as chair of Wendy’s Corporate Social Responsibility Board Committee, Mr. Peltz should be upholding real human rights for farmworkers instead of hiding behind an illusory Supplier Code of Conduct that excludes workers’ voices and lacks consequences for abuses. Sexual violence and other human rights abuses are shockingly widespread in the Mexican produce industry where Wendy’s is currently buying its tomatoes. 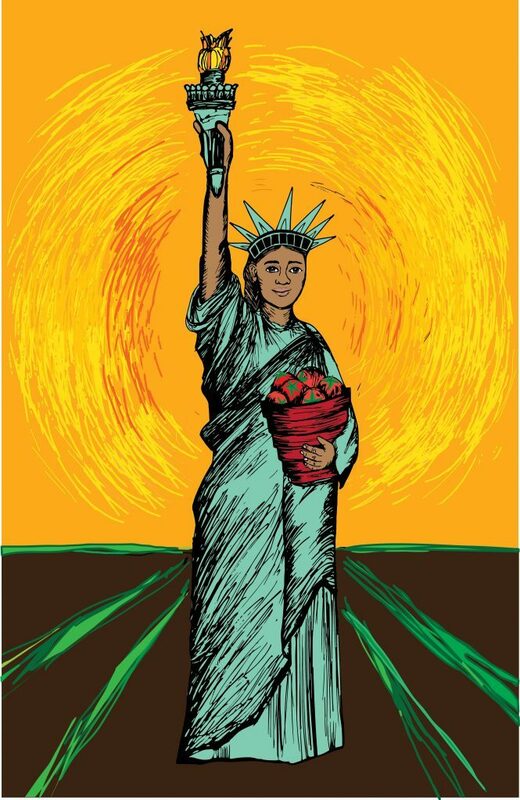 Wendy’s urgently needs to join the Fair Food Program to do its part in building a future in which farmworker women no longer have to surrender their dignity just to put food on their families’ tables. On Nov. 20, call the offices of Wendy’s Board Chair Mr. Nelson Peltz ahead of a major boycott mobilization there that same day! BREAKING: National faith leaders announce major Wendy’s Boycott fast and action for January 18, 2018, on the 20th anniversary of farmworkers’ 30-day hunger strike! Whole Foods: Fair Food tomatoes and strawberries a “Top Food Trend for 2018”!